Welcome to Mitaso Comtel Limited, Manufacture and Exporter of Sheet Metal and Heavy Fabrication Components. The company was established in 2007 at Faridabad. We have spread our wings to South Asia, Africa and Middle East. Customer centric organization, Perfect finish and low maintenance are the plus points of our organization. We offer a wide assortment of Insulated Panels, Cladding Sheets and Telecom Shelters. Our Telecom Towers, Cold and Clean Rooms are best in the industry amongst others. We offer Bunk Houses, Hinged Doors and Evaporation Units that are widely appreciated in the market. 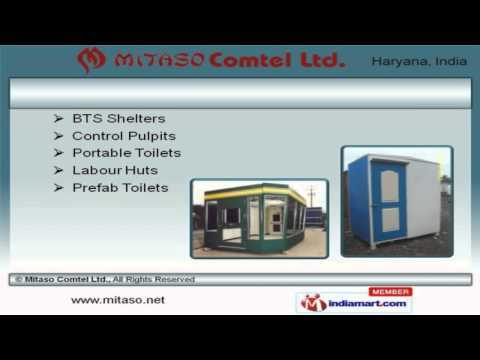 BTS Shelters, Control Pulpits and Prefab Toilets offered by us are available at affordable prices. Along with that we offer Blast Rooms, Acoustic Hood and Prefab Shelters that are reckoned all over the world for their superb quality. We also provide Independent Car Parking and Freezer Room for Food Industry that are a class apart.